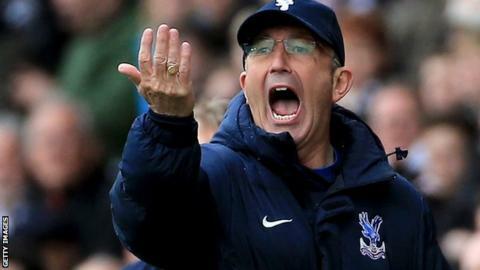 Tony Pulis has been appointed head coach of Premier League strugglers West Bromwich Albion. Pulis, 56, has agreed a two-and-a-half-year deal with the Baggies and will take charge after Thursday's Premier League game at West Ham. The ex-Stoke and Crystal Palace manager is the club's fourth head coach in a year, following Alan Irvine's sacking. Pulis said: "Every successful club is built on unity and that is what I shall strive to help bring to Albion." 1992-1994: Bournemouth; 1995-1999: Gillingham; Jul 1999-Jan 2000: Bristol City; Jan 2000-Oct 2000: Portsmouth; 2002-2005: Stoke; 2005-2006: Plymouth; 2006-2013: Stoke; Nov 2013-Aug 2014: Crystal Palace. Pulis, who managed Stoke from 2006 to 2013, steered Crystal Palace clear of relegation trouble last term. A strong second half of the campaign saw them finish 11th, while Pulis won the Premier League manager of the year award, but he quit two days before the start of this season. He joins West Brom with the club just one point above the relegation zone after former head coach Irvine was placed on gardening leave on Tuesday having won only four of his 19 league games in charge. Pulis added: "We need everyone together from top to bottom - the supporters, all the staff, the players, everyone who has an interest in the club's welfare. "Man management is the key to it. You can't treat them all the same and that's why Tony gets the best out of players and he certainly did that at Stoke, especially the first season in the Premier League. He's a manager that looks at players and doesn't ask them to do things they can't do. He gets the best out of them and puts that winning mentality into them as well." "With that, we can go forward together and hopefully take this club up the Premier League." The 56-year-old will meet with his new players on Thursday before watching the game against West Ham from the stands. West Brom will retain their continental structure - in which the head coach works to technical director Terry Burton and sporting director Richard Garlick, who in turn report to chairman Jeremy Peace. But Pulis, who is expected to bring in Dave Kemp whom he worked with at Palace and Stoke as his assistant, has been assured he will have full control of all first-team matters, including the buying and selling of players. Burton said: "We are delighted to secure a man of Tony's calibre and proven ability. "He made it clear that this position excited him and that he was eager to get back into the business of winning Premier League points - and there are few who know how to do it better."